Labor-management partnerships will not revive the union movement. As late as 2008, it was not unreasonable to think that the stars were aligning for a long-awaited revitalization of the US labor movement. The financial crisis focused popular anger on the Wall Street financiers whose speculative activities brought the global economy to the brink of collapse. The election of Barack Obama and Democratic majorities in both houses of Congress raised labor’s hopes for the passage of an economic recovery program and long-sought labor law reforms. And it seemed as if workers themselves were finally willing to take action against the decades-long trend of increasing corporate power and inequality. The occupation of the Republic Windows and Doors plant in Chicago by a militant United Electrical Workers local — an action that drew approving notice from the president-elect and much of the public — electrified labor’s ranks and seemed to echo President Franklin Roosevelt’s support for unionization and collective bargaining during the New Deal. This appeared to be the most favorable set of circumstances for the US labor movement in decades, and the first significant hope for revitalization since the successful Teamsters strike against UPS in 1997. It didn’t happen. Labor law reform was sidelined in favor of health care reform, and the Republicans rolled up big electoral wins at all levels in 2010 and 2014. Despite widespread popular anger at the multi-trillion-dollar bank bailouts, the financial sector has come out of the crisis stronger, and corporate profits are at record levels. Economic inequality has continued its upward path. Fast food and retail workers have shown a new willingness to protest and engage in collective action, and their efforts have spurred minimum-wage increases in a number of states and cities. Still, private-sector unionization continues to move toward total collapse. And in the public sector, the labor movement’s last stronghold, state-level attacks on collective-bargaining rights and anti-union cases in the judicial system have set the stage for a decisive offensive against organized working-class power. 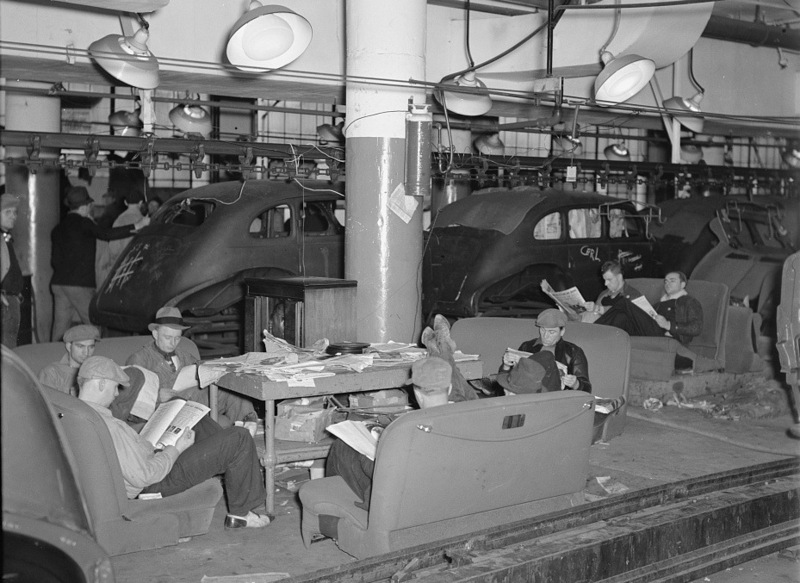 The writing is on the wall: unions as we have known them since the 1930s are in their terminal stage, and likely have only a short time left as a social institution of any major political significance. The private sector is essentially union-free, and public-sector unions don’t have the capacity to defend themselves against legislative and judicial assaults, even in states that are supposedly union strongholds (see Wisconsin and Michigan). Anti-union forces can taste the blood in the water, and their offensive is only getting broader. Between efforts to pass right-to-work laws at the state and local levels and legal challenges like Harris v. Quinn and Friedrichs v. California Teachers Association , the legal-institutional basis of US trade unions is being dismantled. And once that’s lost, it will probably be impossible to bring unions back as they were before. For the last two decades, Thomas Geoghegan has been one of the most astute chroniclers of the labor movement’s excruciating decline. His first book, Which Side Are You On? , is a classic — unique among its peers for the liveliness of its prose, its focus on the lives of the rank-and-file, and its honesty about the many shortcomings of unions and their leaders. As a lawyer who cut his teeth defending dissident members of the United Mine Workers and the Teamsters as well as the venerable Association for Union Democracy, Geoghegan has an intimate understanding of how unions have often failed to adequately represent their members and live up to their promise. His dissatisfaction may have prompted him to look overseas. His last book, Were You Born on the Wrong Continent , is a paean to the European welfare states. And his new book, Only One Thing Can Save Us , faces up to the grim realities confronting unions and makes the case for a US labor movement of a new type, one that eschews the traditional models of unionization and collective bargaining and takes its cues from counterparts abroad. There’s much to like about the book. Above all, Geoghegan is willing to entertain the notion that the legal-institutional model of postwar US trade unionism is rotten to the core. Specifically, he realizes that practices like the agency shop and exclusive representation hobble labor’s cause by making union membership coercive and by providing a material base for the leadership’s disconnect from the rank-and-file. Agency shop agreements give unions the right to collect something akin to a compulsory tax from everyone in the bargaining unit of a unionized firm. While most labor activists would argue that this is necessary to ensure the financial viability of the unions, it’s not difficult to see why these arrangements are widely unpopular. As Geoghegan argues, “What makes labor such an alien thing” among U.S. workers “is that it can take a chunk of people’s paychecks without their consent,” and it’s a major reason why anti-union forces have been so successful in Wisconsin, Michigan, and elsewhere. A recent Gallup poll found overwhelming public support for “right-to-work” laws that end the agency shop, including two-thirds of Democrats. In the same poll, 64 percent of respondents rejected the free-rider argument that workers who benefit from a union contract should be required to join or make financial contributions to the union. Labor’s best argument against right-to-work is a political loser, both in the ballot box and in the courts. But what if the labor movement gave up on the practice of exclusive representation and embraced members-only unionism, as was common through the 1940s? What if it scrapped the winner-take-all approach and organized workers even when they didn’t have majority support? Doing so would relieve unions of the requirement to represent everybody and allow them to bargain for only those workers who voluntarily chose to be members. This argument has long been common among radical critics of the current model, and it’s gaining wider support from more mainstream voices in and around the labor movement. It could also allow different unions to compete for members doing the same jobs in the same shop, which might help spur the process of union renewal. Though most labor activists view inter-union competition as wasteful and destructive, the two great waves of union organization in the US were marked by ferocious competition between unions for members and influence. Today, unions rarely “raid” each other’s turf. They can simply collect dues from bargaining units they gained the right to represent years, even decades, earlier. Also, individual workers can’t simply change their membership to another union if they want to; the only exit is through a decertification election, which is relatively rare and difficult to pull off. What’s so frustrating about this setup is that any good organizing campaign breaks down the perception of the union as a third party by involving the workers and their shop-floor leaders at every step. But after the campaign is won and the organizers leave town, that’s exactly what the union often becomes. Unions should expect to lose their traditional mechanisms of dues collection, either through the spread of right-to-work laws or a Supreme Court decision that finds them unconstitutional nationwide. Geoghegan proposes that the labor movement deal with that reality by entering into a grand bargain with their adversaries: give up the agency shop and everything that comes with it in return for a legally enforceable right for workers to organize unions. The labor movement might see its numbers, income, and political clout drop in the short term, but in the longer run making union membership strictly voluntary (as is common in the rest of the world) could very well strengthen it. “If the union is 30 percent, if it is nothing but the true believers, it is more militant; it has a sharper message,” Geoghegan writes. “And it may be more inclined to strike.” Unions entirely comprised of committed members might be better positioned to mobilize workers beyond their ranks in struggles for the working class as a whole. In effect, Geoghegan argues that the anti-union right may be doing us a favor by tearing down the framework of postwar trade unionism, which effectively prevents workers from engaging in collective action even if they are organized in a union. By making us weak according to the traditional measures of labor’s strength, they may be forcing us to adopt organizational models that are more responsive to members and allow them real opportunities to participate in the life of the union. This may turn out to be wishful thinking, born of despair. Why should the other side go in for the “grand bargain” and give us a chance to regroup when they can just kill us outright? But it’s equally as wishful to think that the labor movement can be revitalized in its current form. So what’s next? What does Geoghegan’s reimagined labor movement look like, and how do we get there? Here’s where the problems come in. For all his apparent faith in the power of workers’ self-activity, Geoghegan’s strategic proposals simply repeat the fundamental weakness of twentieth century US trade unionism: its dependence on employers and the state. Geoghegan is enamored of the European welfare states, and the German model of “stakeholder capitalism” in particular. The book is replete with praise for mitbestimmung, or co-determination, under which workers have the right to elect representatives to works councils and have a say over certain aspects of company policy. The practice has been credited with helping prevent mass unemployment in Germany during the worst days of the economic crisis, and the IG Metall union has used it to pressure Volkswagen to implement a system of worker representation at its plant in Chattanooga, Tennessee. According to Geoghegan, the labor movement should aim not to reform labor law, which has proven all but impossible, but rather to amend corporate governance policy. In this way, companies would be held accountable not just to their shareholders but to their employees and other “stakeholders” as well. But it’s difficult to view the German model as the wave of the future for US labor when employers are giving up on it in Europe. As the German economy shifts from manufacturing to services and from larger firms to smaller ones, works council representation and collective bargaining coverage is steadily decreasing. New companies in growing industries don’t want to deal with unions or works councils, and so far they’re been rather successful in resisting them. As a result Germany has experienced something of a strike wave in recent years; the ongoing work stoppages at Amazon distribution centers are only the most conspicuous example. There were 367 strikes in Germany in 2012; in 2013 that figure spiked to 1,384. In response, the Merkel government has introduced a bill that would restrict the ability of certain unions, specifically those outside the main trade union confederation, to engage in strikes and other forms of industrial action. In addition, the German low-wage sector has grown dramatically since the implementation of the Hartz IV labor market reforms a decade ago. At close to one-quarter of total employment, it rivals the vast US low-wage labor market. Particularly troubling is the rapid proliferation of so-called “mini-jobs” that keep workers trapped in low-paid and highly precarious forms of employment. The recent introduction of a national minimum wage will help, but like their counterparts in the US, German workers’ wages, particularly at the lower rungs of the labor market, have been stagnant for years. Today the German model is predicated on domestic wage suppression, the erosion of worker representation and collective bargaining coverage, and beggar-thy-neighbor monetary policies that continue to drive the crisis in the eurozone. It’s not to be emulated, and the left-liberals and social democrats who continue to praise it should know better. The UAW in particular committed itself to this strategy in the 1980s. It’s only brought the union closer to the employers while imposing massive concessions — above all the two-tier wage structure — on the membership. Throughout the book, Geoghegan is preoccupied with maintaining the competitiveness of US corporations, manufacturing firms in particular. There’s lots of handwringing about how we “don’t make stuff anymore,” even though the US remains a manufacturing powerhouse and manufacturing employment is in sharp decline everywhere, including Germany. At various points, he makes claims like “We’re in the clutches of foreign creditors” and “We have to get the independence of our country back,” from the Chinese in particular. Geoghegan is no xenophobe, but this is uncomfortable stuff, redolent of labor’s ugly anti-Japanese rhetoric of the 1980s. But this is precisely what the Make More Stuff coalition is built on. This is where partnership ideology, nationalism, and anti-finance populism takes you, and it’s not a path the labor movement should go down. Instead, he argues, workers should leverage socially disruptive action to create splits within the Democratic Party and push it to implement corporate governance reform. Through demonstrations and other actions aimed at influencing public opinion, workers might generate the perception among Democratic leaders that the country is ungovernable, and that the only way to restore order is to support the establishment of a new labor movement. It’s Frances Fox Piven’s tactics in the service of essentially conservative goals. This is absurd. It completely leaves out the great wave of worker upheaval that swept the US from 1933 to 1937, which really did threaten to make the country ungovernable and made politicians think twice about calling out the National Guard. And their main target wasn’t politicians or congressional staffers or “thought leaders”: it was the boss. The fast-food and retail worker actions are inspiring and necessary, but as Jane McAlevey has argued, they “aren’t strikes just because someone spelled them s-t-r-i-k-e-s.” Unlike the Chicago Teachers Union (CTU) strike of 2012, they don’t directly target the boss, and they haven’t succeeded in doing what strikes are supposed to do: stop production. Geoghegan repeatedly praises the CTU strike, but he misses its biggest lesson: workers can successfully influence politics only if they have control over their own organizations and can exercise collective power on the job. This is obviously not to say that influencing politics or public policy is unimportant. But for too long, unions have undervalued the crucial need to build strong organizations in the workplace itself. By prioritizing public relations and electoral-legislative maneuvering, they’ve cut themselves off from their biggest source of potential power — their own members, who will only gain the capacities necessary to exercise leadership in wider political struggles through direct action against their bosses on the shop floor. This has long been the soft underbelly of trade unionism in the US, and it’s been exposed for all to see in the current anti-union offensive. The dissident UAW member Gregg Shotwell put this point most eloquently in his book Autoworkers Under the Gun : “Politics is the cart. Work is the horse, the driving force. If we can empower workers where they live and work every day, then and only then can we organize a real resistance, a real union, a real social movement.” And that won’t be done through overtures to partnership or by making workers into junior managers on corporate boards. Despite these criticisms, Geoghegan’s book is a valuable contribution to current debates about the future of the labor movement. The US labor movement can often be an intellectually bereft place, and Geoghegan deserves a lot of credit for the contributions he’s made to combatting its debilitating stolidity.